Py Math Game is a 3-D board game made out of quality wood and designed by a mathematician who had a vision of making math fun for kids. If you are a student who thinks that math is hard and can never be fun, then Py Math Game will change your mind. If you are a parent who wants to improve your child’s math skills in an innovative and refreshing way, then Py Math Game is a wise investment. Do you want to know your kid’s math mind? Try Py Math Game once with your kids, you will know it! This uniquely designed game is also being used in the math classroom as a tool for motivating kids and making kids interactively engaged. Teachers can see that kids are teaching and learning math each other while they are playing the game and having fun. The rules are so simple that anyone from kindergarten to college students can learn and play no time at all regardless of your math knowledge or grade level. For kindergarteners, Py Math Game creates an opportunities for them to feel comfortable with numbers and same time they can learn and practice number recognition, counting, and order of numbers which are backbone of math. For the higher grade levels, simply by adding some of math operations (addition, subtraction, multiplication, and division) and/or functions (power, root, factorial or algebraic expression), Py Math Game becomes more challenging and exciting to all. You can start the game with your level and quickly improve your math skill without knowing. Py Math Game has endless variations for all and grows with kids. 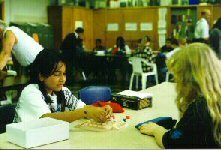 Py Math Game can be played by yourself alone or with others or mixed grade levels. Py Math Game is patented in the United States and other countries. Py Math Game is shipped from our warehouse to maintain the lower cost. The game can be purchased either directly from this website or by calling our warehouse to place an order. Upon request, school presentations are available — please visit the “School Presentation” page for detail.